The Aston Martin DB4 was a design based on the wonderful DB3 but with a completely new body and incorporating a new engine designed by Polish engineer Tadek Marek to replace the Lagonda in-line 6 cylinder of the DB3. In production from 1958-1963 the DB4 became the basis for the DB5 of James Bond and “Goldfinger” fame, though standard production cars lacked the bullet proof rear shield, oil slick dispenser, twin Browning machine guns and the wickedly useful passenger ejector seat. The DB4 was also the basis for the DB6 which, despite its lack of a James Bond association was an even better car, even if not quite as pretty. So it was the basis for Aston Martins up until 1971. The Aston Martin DB4 was also the basis for another lesser known car from Aston Martin; the Lagonda Rapide of 1961-1964. The Tadek Marek 3.7 liter in-line six cylinder of the Aston Martin DB4 which replaced the Lagonda I6 of the DB3. The Tadek Marek in-line DOHC six cylinder engine was used in various iterations in the DB4, DB5 and DB6 as well as in the four door Lagonda Rapide of the early sixties which we featured in the post immediately prior to this one. To see that post click here. Tadek Marek also designed the V8 engine that was trialled in a DB5 and used in production in the DBS V8, later re-styled and simply known as the Aston Martin V8 for two decades from 1969-1989. So, although the traditionalist romantics amongst us would have liked to have seen W.O. Bentley’s “piece de resistance“, his V12 engine, in the resurrected Lagonda Rapide, the Tadek Marek DOHC six was the more practical and more economic choice for Aston Martin. In the DB4 the 3.7 liter engine had twin SU carburettors and produced 240bhp. 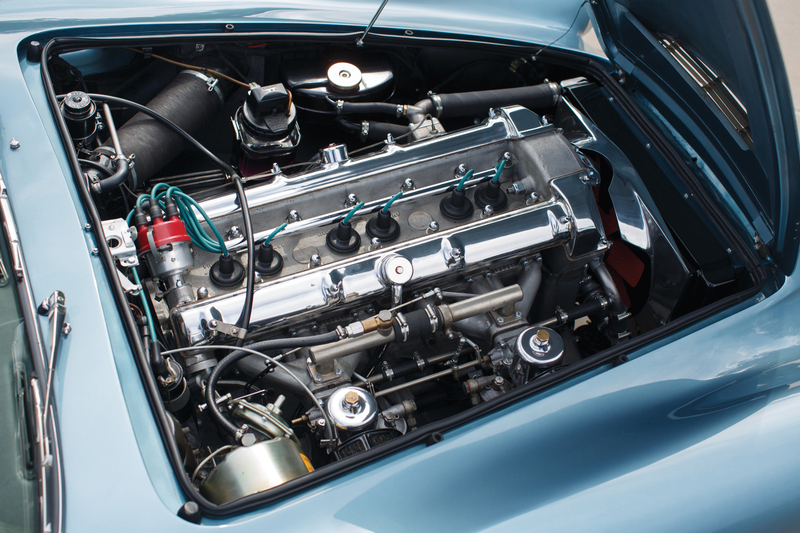 The engine was aluminium so it was much lighter than an iron and steel one and that was a good feature of it, but in the early model DB4’s the engine proved to be prone to overheating, which was not a good feature. 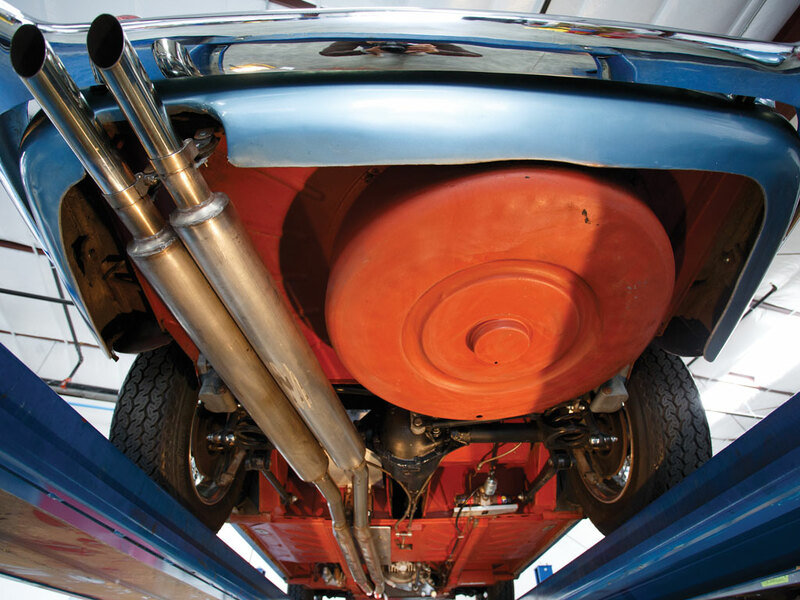 The problem was amended during 1961 by fitting of a larger oil sump and and an oil cooler. Many owners of the earlier Series I and Series II cars that had the smaller sump with no oil cooler had the large sump and oil cooler fitted as after sales equipment. The Series III cars that went into production part way through 1961 had the larger sump and oil cooler as standard equipment. Series III cars can be distinguished by their triple round tail lights which replaced the “cathedral” style seen on the Series I and II cars. The rear suspension of the DB4 retained the tried and tested positively located live axle with coil springs as used on the DB3. Suspension of the DB4 used the familiar positively located live axle using a Watts linkage with coil springs as per the DB3. Plans had been made to use a semi-independent De Dion rear suspension in the DB4 but curiously this only appeared in the Lagonda Rapide which was derived from the DB4 stretched to create a spacious four door saloon. Front suspension was ball jointed wishbones with coil springs. Brakes were servo assisted discs all around. The standard differential ratio was 3.54:1 for Britain and the Continent, whilst for US models the ratio was 3.77:1. An optional 3.31:1 differential was available for cars intended for long distance high speed use. 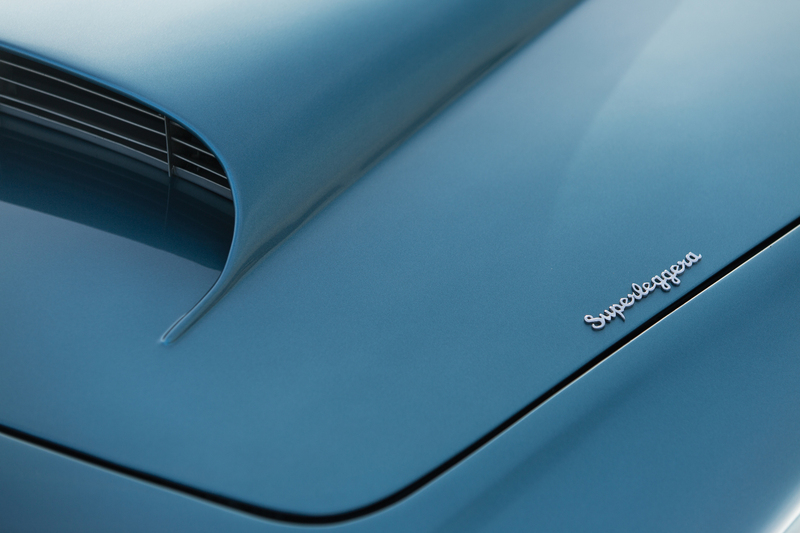 Bodywork of the DB4 was designed by Carrozzeria Touring of Italy but made in Britain. The bodywork of the DB4 gained the car much attention. It used an Italian Carrozzeria Touring designed Superleggera tubular frame with an aluminium body, making a very lightweight structure that could be made sleek and pretty as well as practical. On the Aston Martins the aluminium alloy used for the body work was the British “Birmabright” which was also used on Land Rovers. Although lightweight this construction method puts unlike metals together and can tend to create unlike metal corrosion as the steel and aluminium tend to react with each other wherever bare metal contact occurs. So, just as with a Land Rover with its steel frame work and “Birmabright” aluminium panels, this needs to be monitored and properly maintained. All that being said the Aston Martin DB4 and its successors stand amongst the most beautiful examples of the art of automotive design ever created in Britain. 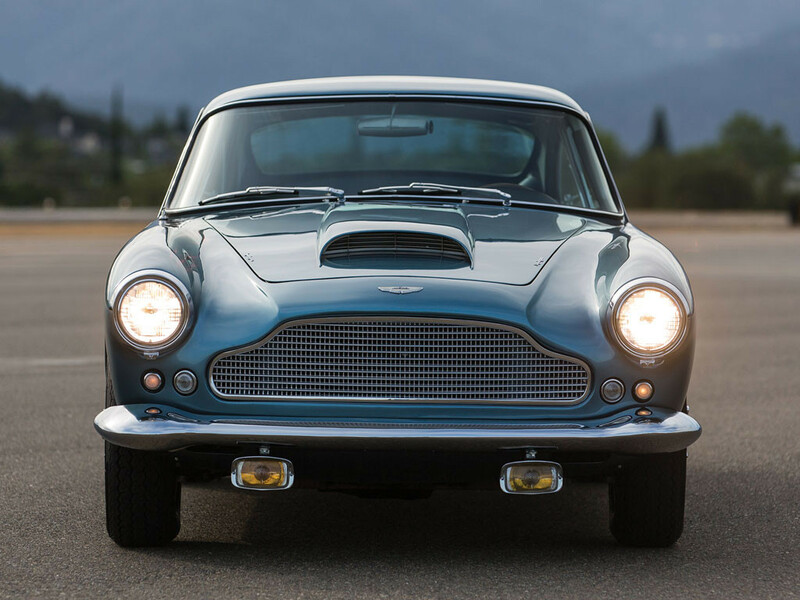 Front styling of the DB4 with the characteristic Aston Martin Grill with “egg crate” style. A British car with something of an Italian look. Rear styling has just a hint of Ferrari about it. The pretty use of the rear fins was abandoned for the DB6 in favor of a rear spoiler to promote down-force at speed. 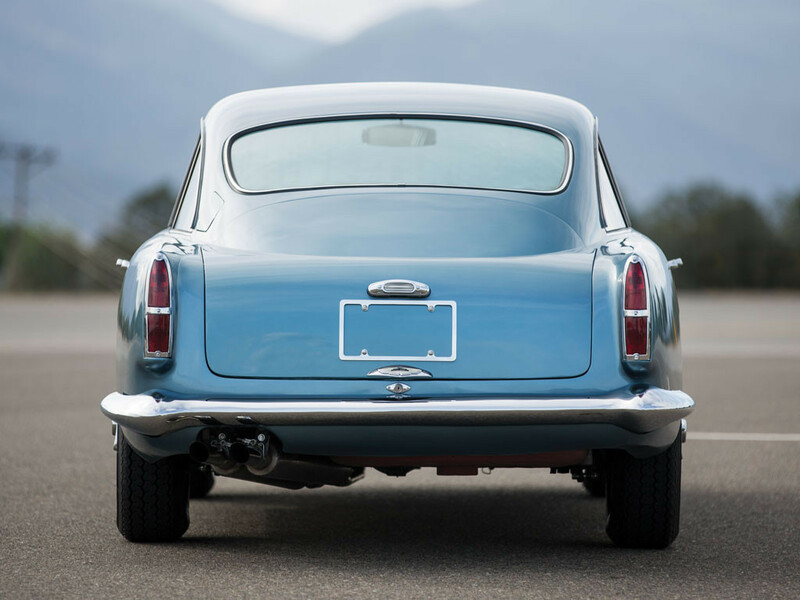 The 1961 production of this car and the “cathedral” type tail lights identify it as a Series II DB4. 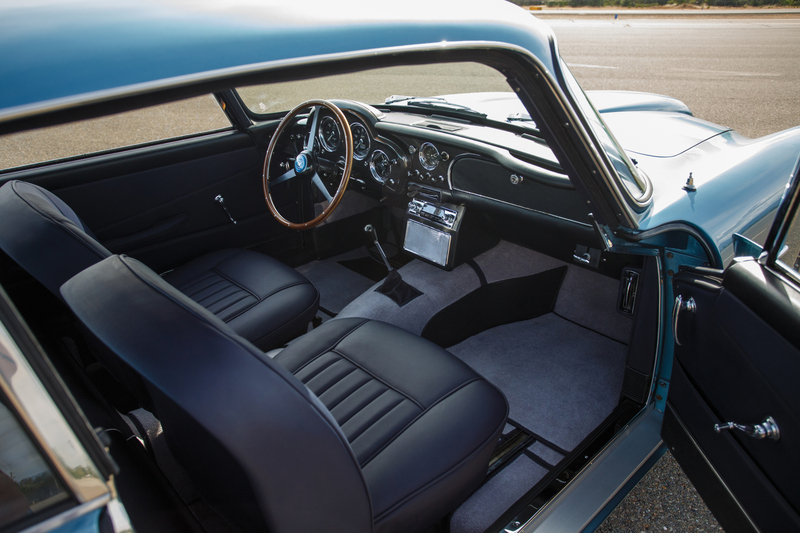 The interior of the DB4 was kept practical and minimalistic as befits a serious sports car. Interior was leather and instruments clustered in the driver’s direct line of sight. The best arrangement. 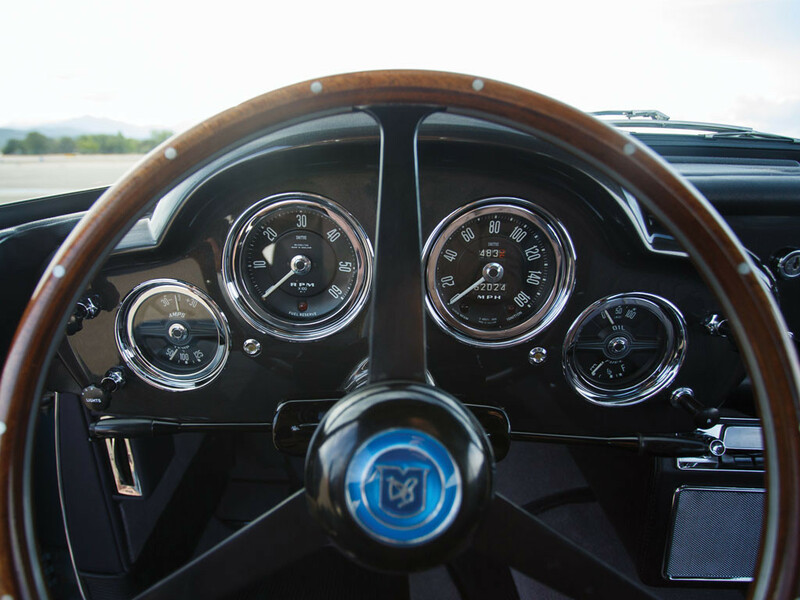 Classic Aston Martin instrument layout, everything visible in the driver’s direct line of sight. The interior of the DB4. Clean and uncluttered; the simplicity providing an impression of spaciousness. 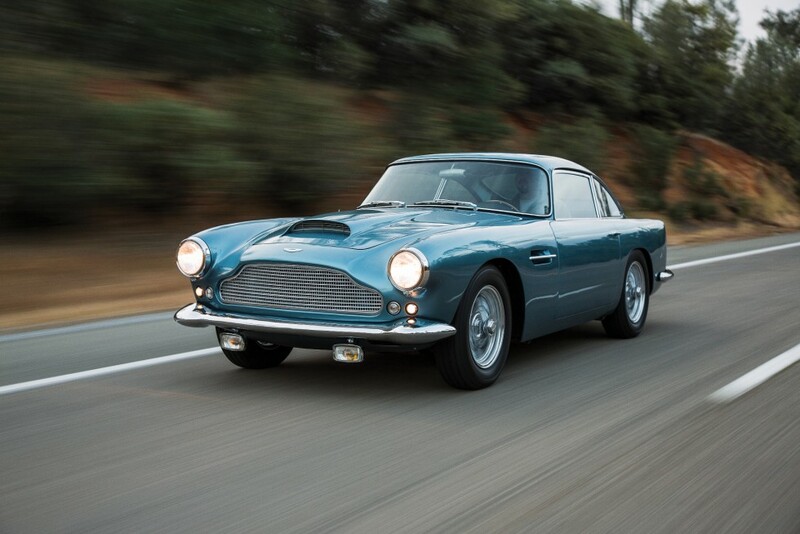 Performance of the Aston Martin DB4 was lively as one would expect an Aston Martin to be. Top speed was just 140mph, 0-60mph being accomplished in 9.3 seconds. Fuel consumption was around 18mpg for British “Imperial” gallons and around 15mpg for US gallons, so she was a thirsty but lively motor car. 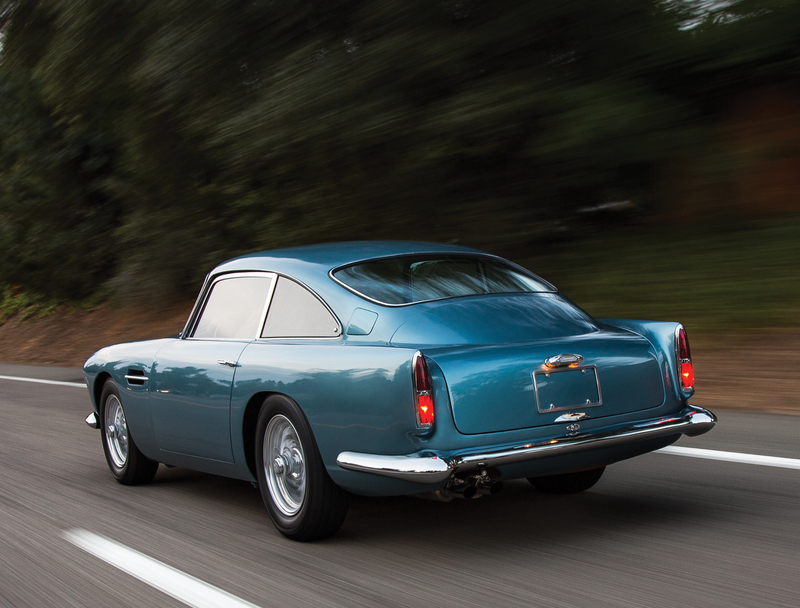 The elegant beauty of the Aston Martin DB4 as commonly admired from a rear quartering angle as one is passed by one. Gearbox: Four speed manual with optional overdrive or 3 speed Borg Warner automatic. Front Suspension: Wishbones and coil springs. Rear Suspension: Live axle with Watts Linkage and coil springs. Brakes: 11.5 inch discs on all four wheels with servo assist. 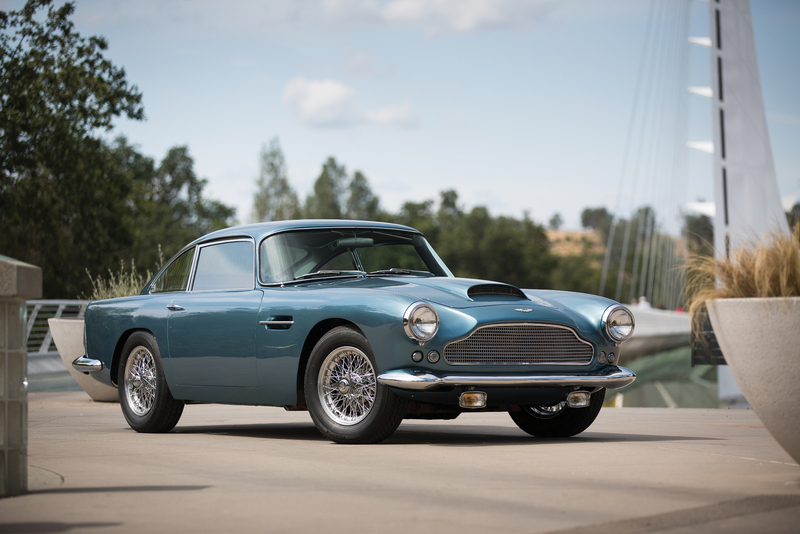 The particular Aston Martin DB4 we have featured in this post is coming up for sale at RM Sotherby’s Monteray auction on 13th-15th August 2015. If you would like to look at the auction information page click here. At the time of writing RM Sotherby’s had not yet published full details about the specific car on sale. The car features the standard 4 speed manual gearbox and wire wheels. 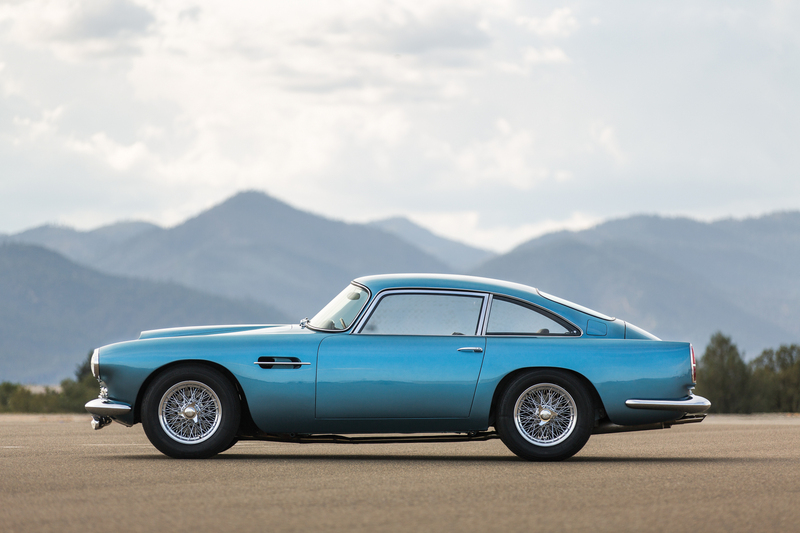 The Aston Martin DB4 remains one of the most desirable cars ever made in Great Britain. It is one that is sure to attract admirers wherever it may go.